It hopes to reach a deal with the province's new transport minister in the coming months. A blue and a black balloon are floating outside at a pro Uber rally April 29, 2016 in Montreal. MONTREAL — Ride-hailing service Uber is backing down on a threat to shutter its Quebec operations, at least for now. The multinational announced Friday it won't pull the plug on its Quebec wing as planned this weekend because it hopes to reach a deal with the province's new transport minister in the coming months. 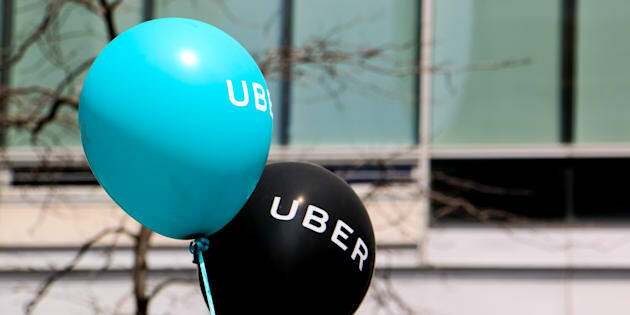 "We recognize there is an opportunity to establish a constructive dialogue aimed at finding a lasting solution for riders and drivers in Quebec," Uber Quebec general manager Jean-Nicolas Guillemette said in a statement. In late September, the province announced it would renew a pilot project agreement for one more year, but added new provisions that included 35 hours of mandatory training and police background checks. Andre Fortin is sworn in as Minister of Transportation of the new Liberal cabinet at the National Assembly in Quebec City, Oct. 11, 2017. Transport Minister Andre Fortin indicated the province is standing by those changes, adding in a separate statement Friday the new requirements are a matter of fairness and safety. The San Francisco-based company is at odds with the province's requirement for 35 hours of training, as regular cab drivers go through, instead of just 20 hours as they'd been doing. Uber argued the provision destroys the firm's business model of employing part-time and casual workers, who couldn't even try the service without the training. It had promised to cease operations as of Saturday if the province didn't revert to the original pilot project agreement. But the time it will take to phase in those rules will allow both sides to negotiate, the company said. "We've confirmed that the new training requirements that would impede our ability to operate do not have to be initiated for a few months, and we are committed to working with the government over this period," Guillemette added. On Thursday, Premier Philippe Couillard told reporters the province wouldn't bow down to a multinational service. He also said taxi drivers could be compensated financially if they demonstrated they'd lost out because of the Uber deal. Taxi drivers have been incensed with Uber ever since it arrived in the province. For decades, Quebec has limited the number of taxi permits in each city in the province. The cost of each permit soared to six figures, forcing owners to find funding to pay for them. Uber bypassed that regulation and started offering people rides without its drivers having to obtain a costly permit. Due to lower overhead, the company was able to undercut the traditional taxi industry and cabbies argue the value of their permits has diminished significantly as a result. "If there are any economic consequences for cab drivers for the value of their (taxi) licences, we will provide fair compensation," Couillard said Thursday.